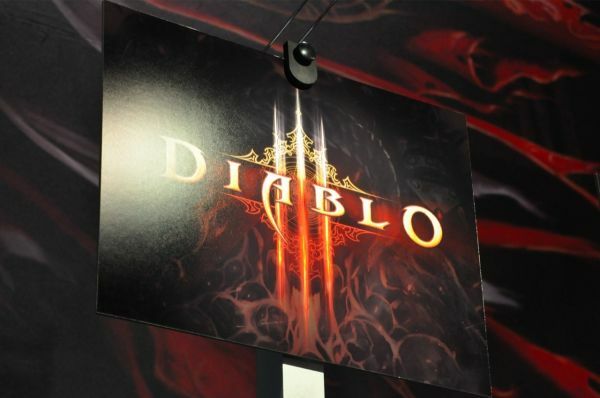 It seems like we've been talking about Diablo 3 for years now, and in fact, we may be talking about it for a few more years until it's finally released. 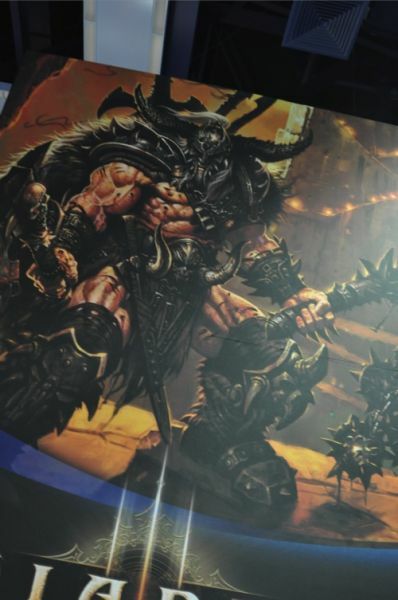 I got a small tease of the game on the PAX show floor, getting my hands on one of the game's new classes, and I gotta say - the wait is way too long! Diablo 3 has four announced classes to date; The Wizard, The Barbarian, The Witchdoctor, and the Monk. All classes, except the Monk, have male and female versions. I chose to get down and dirty with the Monk through a desert level that was on display. The Monk seems to be the evolution of the Assasin class from Diablo 2. He's fast and agile, and is capable of quick and deadly strikes. In fact, we were told that each character in the game has their own unique playstyle. While it sounds like PR speak, there really is some distinct differences in how the game works when playing with that character. For instance the Monk actually has a combo system available that offers trees of combos that players can execute by mixing and matching between them. Create a devastating enough combo and you'll find yourself scoring bonus experience. Anyone that's played a Diablo style game are familiar with the controls, you simply click to attack. Skills can now be bound with the left and right mouse button, which can be switched on the fly by using the tab key. The rest of the skills are easily accessible on a bar at the bottom. Players now collect healing orbs from fallen enemies instead of having to manage healing potions. Despite all the criticisms of the art style, I found the game visually stunning. Subtle effects throughout the world like blowing sand, small creatures running across the desert, and even the particle system which governed all the bloody mayhem looked really impressive. It's pretty hard to make a desert level dark and emo. 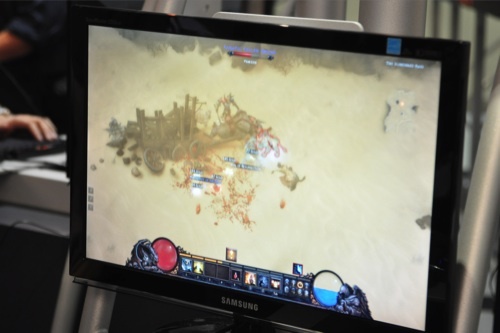 The game was incredibly easy to pick up and play, perhaps because I am a Diablo vet. At one point I found myself surrounded by 60 or so enemies. As they quickly closed in I cast a spell which stunned everyone around me. I then executed a technique called the Seven Sided Strike which launched me around the pack that has surrounded me in what looked like a scene from a kung-fu movie. Finally rounding out the combo I did a an Exploding Palm Technique. Mind you, this was all done simply by tabbing and clicking the controls through my skills. The end result? A gigantic explosion of enemies and blood, and a combo bonus of 1500xp - as well as a new record on the machine, 67 kills at once. A new addition to Diablo 3 is the skills are socketed to make them unique. For instance a simple fireball spell might be socketed with a multi gem which creates multiple fireballs. Or it might be socketed with a lethal gem which would cause it to hit and spread on catch. This concept can be applied to most of the skills in the game to really tweak the experience further to your liking. A Blizzard rep told us the number of players for co-op is still up in the air, currently it's capable of four player co-op. According to him, it's not an engine limitation, but a gameplay preference that they are leaving it at this number. They had tried higher numbers of players, but found the screen simply got too chaotic to make sense of what was going on. I suppose if you have six Monks exploding 67 guys at once - well that's 335 geysers of blood! Speaking of co-op there's a lot of tweaks done with the game to make it a bit more streamlined. The aforementioned healing globes are shared, so when one player picks them up all players gain the benefits. Loot dropped by monsters are instanced, so only you are able to pick up your own loot. Sorry ninja looters! According to the rep they are really focusing on making the cooperative experience as tight as possible. I truly wish we didn't have to wait until, oh God I don't want to say it, 2011 for Diablo 3. Perhaps some miracle, some force of nature, or something will help its development along and we'll see a holiday 2010 release. Until then I'll have my memories of 67 kills to go on. Page created in 0.2415 seconds.